I have a “To-Do List” just like everybody else driven to create such a beast. I know there are folks who don’t use them and there was a time when I didn’t either. But I have one now. It typically lives inside my head where it screams obscenities and insults at me. And wouldn’t you know the nasty beast has a good vocabulary too? Back in the days of my Life Without a To-Do List (it largely coincides with the Life Before Kids) I was rather dismissive of the folks with To-Do Lists. Why use a piece of paper when you could just remember everything you need to do? But now, I am totally not dismissive of anyone using a To-Do List–primarily because I am so dang submissive to my own. My To-Do List rules my life. And yet, before a few minutes ago, you wouldn’t have found one anywhere in my house. Not on my laptop, my smartphone, anywhere. Because my To-Do List is in my head, yelling obscenities at me, remember? In hopes of saving my sanity, I decided to get the hateful thing out of my head and onto a piece of paper where I could give it the side-eye and yell back at it. I actually typed up a little prototype to try for the next week. I designed it based on something the agent, Kate McKean posted this morning out on Twitter: GTD breakthrough, you guys: My To-Do list is two facing pages, 1: short tasks, 2: long tasks. I pick according to the time I have. Works!” I changed my column titles to “Tasks” and “Fast Tasks” after Littlest and I giggled about describing different things I need to do during my day. He giggled because the words sounded funny together. I giggled because the alternative was to get depressed. But now I smile when I read “Fast Tasks”, which I think is a mighty fine unplanned by-product. I did this To-Do List making thing after a bit of my own Eureka! moment. Obviously, first I read Ms. McKean’s tweet. And then I thought about my life back when I was a cubicle worker and Eureka-ed again. Life is better in the cubicle. There, I said it. And now let the flaming begin. I’ll get another cup of coffee and then explain myself. A bit of background or explanation or justification… My husband works in the corporate world and has a stressful but rewarding job we are uber thankful for. Most days he comes home, unclips his ID card from his shirt, puts it and his keys in the basket and gets the hug/kiss/DADDY’S HOME!!! !/sniff from the dog/Hi hon, how are you? routine. He is home. His workday is done. That part of his identity is complete for another “x” hours. Mister Soandso may not always be happy or content with his life, but he has his routine – get up, work-out, go to work, come home for dinner, time with his kids, surf Reddit, hang out until bedtime and then get up and do it all over again. The weekends differ but also have a routine of their own, primarily revolving around the kiddos. In between there are lunches with co-workers, drinks with the guys, reading Game of Thrones, that kind of stuff. You know, life. But it is a life with demarcations. I have a life with few demarcations not related to school schedules. And there are no cubicles in my world. I am primarily a stay-at-home-mom; I have a part-time job that I do mostly from home. So my cubicle is the same place where the other stuff in my life happens. There are no lines, only piles of dirty laundry and dust-bunnies dancing under the couches. I left the cubicle for the classroom and then the classroom for home. And I haven’t felt “successful” since then. That was in 2004 and let me tell you, eight years is a long time to feel like a loser because the To-Do List in your head looks exactly the same at 11:30 pm as it did at 6:30 am. I wasn’t a huge fan of the cubicle world when I was doing that gig. Dilbert aptly describes many of its nuisances. But my three years of cubicle existence meant there were three years of punching my time-card at the prescribed times. I knew when lunch and break times were to occur and that I would get them. I knew that when I pushed my chair back under my desk every night, I didn’t need to think about my job again until I pulled my chair out the next morning. The time I spent away from that cubicle was mine. Even when I was a teacher and I carted stacks and stacks of student’s work home and back again, there was my “work self” and my “me self”. If I didn’t want to be Mrs. Martin, the high school English teacher, I shopped 20 miles away from my home. I could separate those parts of myself and while the teaching part bled into my home life, you can bet I never thought once about if the tub needed scrubbing while teaching ninth graders compound subjects. But now, my world is a blended thing resembling something that Van Gogh and Dali might have created if they had collaborated after a night of hard drinking. There are no crisp lines neatly bisecting the whole into tidy pieces. Instead the lines start off strong but then meander off and then stop all together part way through things, only to take up again and head into a different direction. There are bits and pieces where they don’t belong. The colors are flamboyant and would be lovely in more moderate consumption or at least in a more orderly fashion. My world is a world rendered by other’s hands. And while most of it is exactly what I want it to be in theory, the delivery isn’t quite how I planned back when I decided to live life this way. It turns out that a pay-check provides more than income. It and its work place create space for the other parts of one’s identity to flourish in ways that the kitchen table cannot. I want to go to bed at night feeling more accomplished. And not simply in a theoretical way. I want to be able to check things off, to be able to go to bed feeling like a success. I want to find the way to combine the mom parts with the director parts and the writer parts and still have a few hours left over to sleep. Maybe, just maybe, the answer is to write it down and check it off. So my thought is to try this: for a week, try to use a “real” To-Do List and see if crossing off the little things helps me focus on getting some of the big ones crossed off too. If I’ve already checked off the laundry, letting it sit while I work on another task. And ultimately, can I go to bed at night feeling like I really got something done? Or will I go to bed still feeling overwhelmed and underachieved? I doubt Dilbert would appreciate my need to create a To-Do List nor my thinking his day in a cubicle is all that grand. But then, Dilbert can push in his chair and go home tonight thinking to himself, “well, at least I got all those paper clips unchained and back in my drawer.” When I’m doing that, I’m still trying to remember if I got Oldest’s track uniform washed and did I get tater tots or French fries and what was I thinking I would do with the pork chops, grilled maybe?, and what is the best way to get permanent marker out of Littlest’s karate go anyway? I am hoping that a To-Do List breaking tasks into the stuff I know will take focussed attention versus the stuff I can do while supervising piano lessons will help me be able to push my chair back under my kitchen table tonight and feel like I may not have got it all done, but I did enough to get up and do it all again tomorrow. 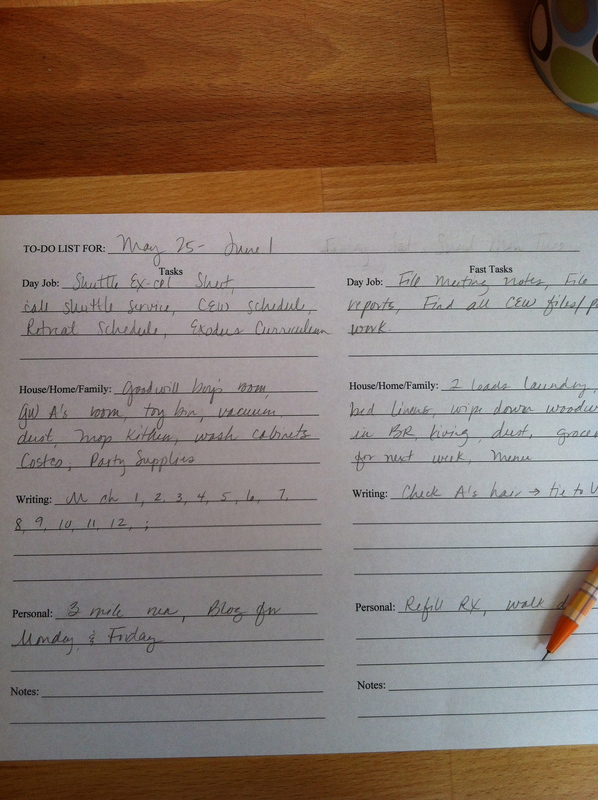 This entry was posted in Front Page, parenting, Writing and tagged organizing, self-esteem, to-do lists by kristina. Bookmark the permalink. HUh. Maybe a to-do list is what is lacking in my life as well. Although my work, when I have work is not from home, there is not enough of it these days to count for much. Some days it seems like I’m plenty busy, others not so much. Definitely something to think about.